For wine producers creating a brand identity which is unique and unmistakeable is an essential part of a winning marketing policy and packaging is an integral part of this strategy. The Group covers major wine labels, from international brands to the most prestigious local products. Guala Closures Group offers a customised approach to produce the largest range of closures for wine in infinite colours, sizes, shapes and materials to satisfy the most complex requirements, with the most advanced techniques of silkscreening, hotfoiling, ofsetting, litography and embossing. 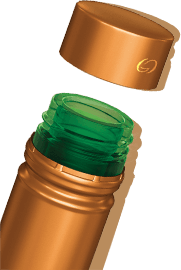 Divinum® is an elegant roll-on screwcap closure, designed to prevent leakage, and maintain the quality, freshness and full flavour of the wine. It’s easy to open and to re-seal. Bottles can be handled and stored both horizontally and vertically. Another important feature of the product is the decoration, which can be applied to the sides and /or on the top of the closure. Roll On TE® is the first Tamper Evident system specifically dedicated to standard aluminium closures. Roll On TE® ensures that a coloured plastic ring, which appears after first opening and closing, can’t be removed without visibly damaging the closure. A simple, economic and safe solution to detect tampering of the closure at a glance. The WAK® closure combines a unique technology with a traditional look. 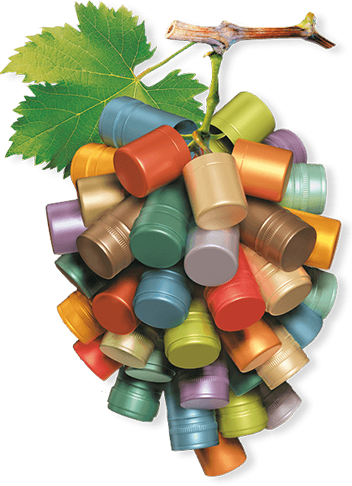 It matches the famous shape of the wine bottle with the numerous advantages of the latest technologies, such as the elimination of TCA and the ease of opening and re-sealing. The thread is not visible from the outside but it is inserted into the long aluminium shell. It is first screwed on to the finished bottle neck, and then tucked under a standard BVS neck ring. The large uninterrupted surface is ideal for the side printing decoration. 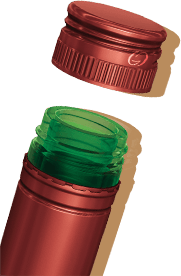 Savin Premium® is a top quality screwcap closure with an internal thread for still wines. 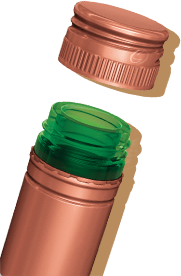 Its unique shape is reminiscent of normal wine bottle capsules and gives the brand a premium finish. 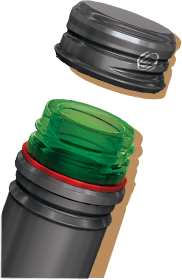 The aluminium inner cap with thread and patented design, not only improves the seal but also gives the closure a very high quality appearance. The larger surface is ideal for side printing/foiling decoration; top decoration can be either printing/foiling or top embossing. 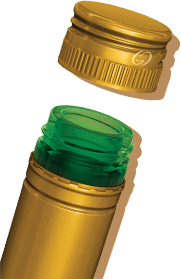 VIIVA® is the ultimate closure solution created by Guala Closures to preserve the quality of sparkling wines. Specifically designed and thoroughly tested to withstand up to 150 psi (10 BAR) of pressure, VIIVA® guarantees the perfect seal both before and after the initial opening. The benefits are obvious: it’s safe and easy to use, provides efficient opening and re-sealing functionality to both the end consumer and the HoReCa sector, and improves efficiency for the producer. 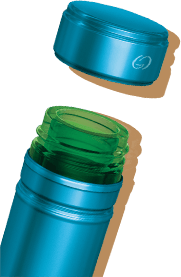 Moss® is the latest screwcap closure designed for lightly sparkling wine. Its exclusive liner offers great sealing performance and maintains a perfect level of carbonation, protecting the freshness and the sparkle of the drink before it is opened and consumed.